In my attic, I discovered a stack of pristine, archival mats that once held my husband’s Brownie Hawkeye photographs. The empty 4″ x 4″ windows challenged me. Could I fill those windows with small paintings? 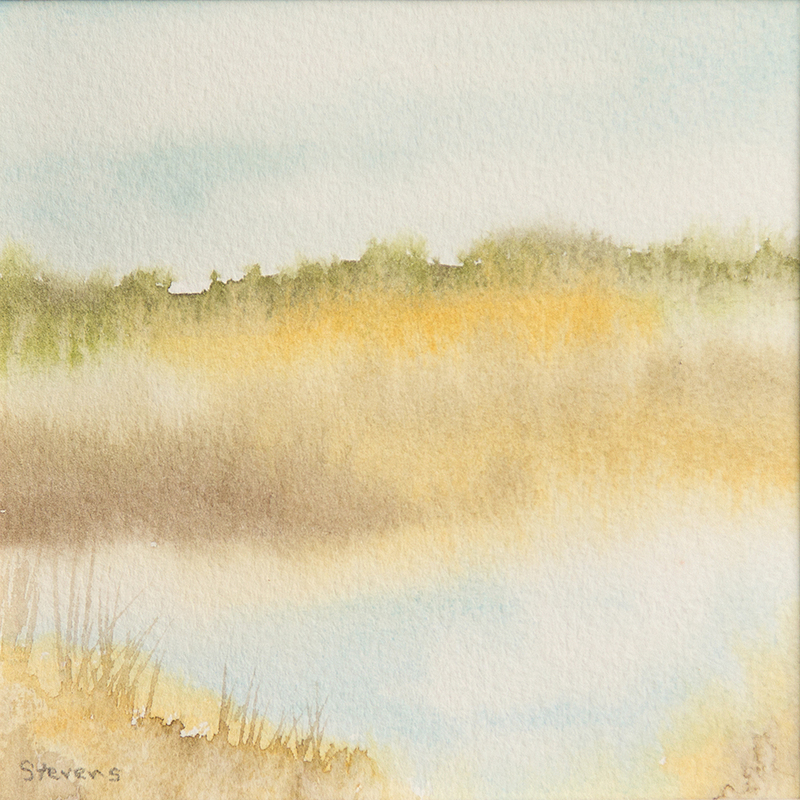 I took one of the mats to my studio and cut small pieces of leftover watercolor paper into 4″ x 4″ squares. I taped one to my support board and sat down to paint. Normally, I do a careful sketch and have a well thought out plan, but on this occasion I only wanted to continue my improvisational state of mind. Three palettes sat on my drawing table with left over paint in the wells. It is unlike me to start a painting without a clean palette and I usually do a lot of mixing before deciding on a color scheme. Into my unplanned sky, I floated Cerulean Blue in a clear wash, leaving soft, white-of-my-paper clouds. Along the bottom of the wet sky I charged in a variety of browns and greens and grays to mingle into a distant tree line. Lower in the picture plane, I dropped Cerulean Blue into a clear puddle that soon became a lake, reflecting the sky. As I worked down the little page, warm, foreground grasses went in and then I was done. I was done and I hadn’t planned a thing. I found this experiment to be meditative and refreshing. I felt so relaxed, I did a few more. What a good day.